Possible bid rigging in Houston’s trash contract? WHAT DO YOU SAY NOW MAYOR? The world’s largest international construction company has a message for Houston Mayor Sylvester Turner in the wake of Hurricane Harvey. It is a message that could mean millions of dollars coming back to Houston taxpayers. Grupo ACS has reaffirmed its support for the ECOHUB project. The support came in a letter delivered to the Mayor and all members of Houston City Council just days before curbside recycling service are set to resume. The letter should make it harder for City Hall to keep trying to cut ECOHUB out of any city business. GRUPO ACS has annual revenues of $39 billion dollars. ECOHUB and the City were in final contract talks to take all garbage to an $850 million dollar privately financed facility to create new products. The program could literally end the need for landfills, but Mayor Turner killed the deal. There’s growing evidence the Mayor help structure a new recycling proposal that would cut ECOHUB out of the competition. ECOHUB founder George Gitschel has loudly cried foul, filing a bid rigging complaint the Mayor simply ignored for months. ECOHUB and Dolcefino Consulting are now suing City Hall for keeping public records a secret. E-mails sent or received by the Mayor’s close confidante Maya Ford have now been subpoenaed in the case. In the few e-mails that have been made public, Ford detailed allegations of possible ethical misconduct against Houston Garbage Boss Harry Hayes. Houstonians have been asking questions too. ECOHUB has promised to share up to $16 million dollars in profits with the City every year, in exchange for the city garbage. Taxpayers wouldn’t have to invest a penny in the plant. 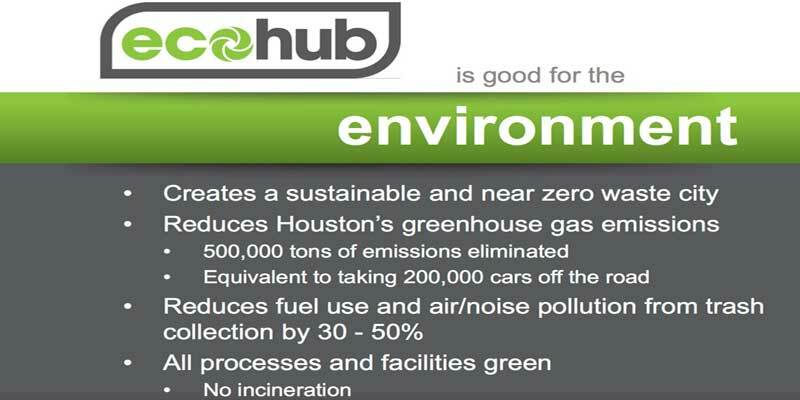 ECOHUB says they could cut garbage routes dramatically, saving Houstonians up to $40 million dollars a year; money which could be used for firefighters and Hurricane relief the first year the plant is open. The obvious question, why would that offer be ignored by the Mayor? Mayor Turner recently selected a foreign company to handle recycling, but there were allegations of favoritism. City Council wanted the contract talks reopened. Hurricane Harvey pushed the recycling scandal out of the headlines, but with recycling starting up again, the contract will be back in the news. The letter from ACS suggests Hurricane Debris should make the City rethink the future of recycling. “Millions of tons of waste from Hurricane Harvey… present new important facts for our City to consider in its decision,” says Carlos Ramiro Visser, Chief Executive Officer from ACS Industrial Services Inc.
Click to view the Grupo ACS letter to the Houston City Council. Harris County Judge Ed Emmett files for re-election! I am so surprised. Monkey business at the city? Thanks, please some furnish their office number thanks.